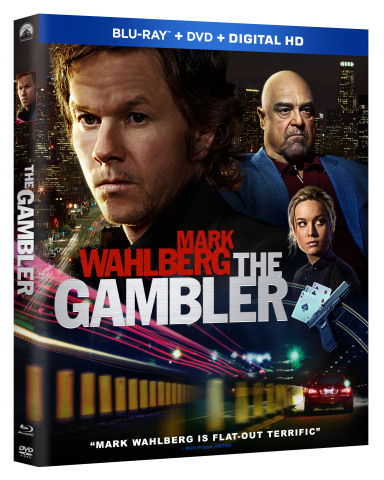 Academy Award(R)-nominee Mark Wahlberg1 stars in the “gritty, intense and wholly engrossing” (Scott Mantz, “Access Hollywood”) dramatic thriller THE GAMBLER, debuting on Blu-ray Combo Pack, DVD and VOD April 28, 2015 from Paramount Home Media Distribution. The film arrives on Digital HD April 10. Wahlberg stars as Jim Bennett, a brilliant professor leading a secret double life as a high-stakes gambler. When Jim is forced to borrow money from a notorious gangster, he places the lives of those he loves in mortal danger. With time running out, he must enter the criminal underworld and risk everything to keep from losing it all. Directed by Rupert Wyatt (Rise of the Planet of the Apes) and written for the screen by Academy Award-winner William Monahan2 (The Departed), THE GAMBLER also stars Golden Globe-winner John Goodman3 (Argo), Brie Larson (Short Term 12, 21 Jump Street), Michael Kenneth Williams (“The Wire,” “Boardwalk Empire”) and Academy Award-winner Jessica Lange4 (“American Horror Story”). THE GAMBLER Blu-ray Combo Pack with Digital HD features over an hour of compelling bonus content including an extensive look at the filmmaking process, Mark Wahlberg’s character transformation, deleted and extended scenes, and much more. Also, for a limited time, the Blu-ray Combo Pack available for purchase will include an offer for $15 off sports tickets at Ticketmaster.com (U.S. only). The Blu-ray Combo Pack available for purchase includes a Digital Version of the film that can be accessed through UltraVioletTM, a way to collect, access and enjoy movies. With UltraViolet, consumers can add movies to their digital collection in the cloud, and then stream or download them-reliably and securely-to a variety of devices. Paramount Pictures presents a Chartoff Winkler and Closest to the Hole/Leverage Entertainment production of a Rupert Wyatt film: “THE GAMBLER.” Executive produced by David Crockett, James Toback and William Monahan. Produced by Mark Wahlberg, p.g.a., Stephen Levinson, p.g.a., Irwin Winkler, p.g.a., Robert Chartoff, p.g.a. and David Winkler. Based upon the film written by James Toback. Screenplay by William Monahan. Directed by Rupert Wyatt.